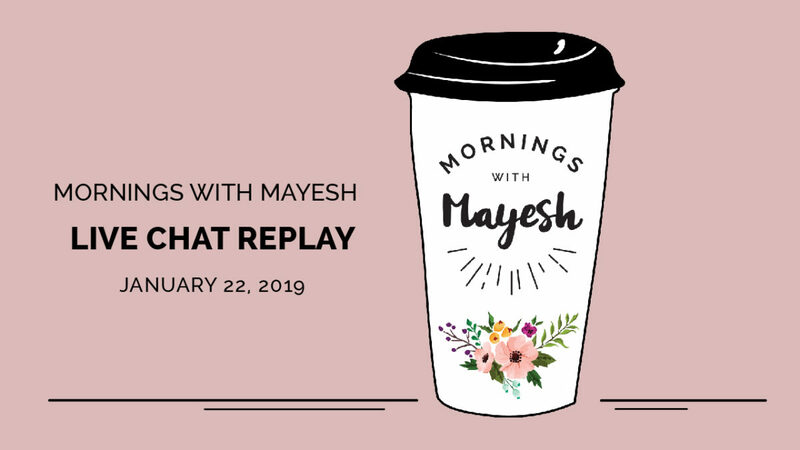 Yvonne, Shelley & Dave chat about smelly baby's breath, peony season, sales rep pain points, how to get your frogs squeaky clean, wedding shows & more in this month's Mornings with Mayesh!! Also, Cristina Barragan, founder of Fleursociety came on to chat about capturing and converting more leads with email marketing with Yvonne. Invaluable information to help grow your business! Save the date for February 19th at 10 am EST for our next show and keep on sending in your floral questions! Dave: orange aloe, ranunculus in different tones of "living coral", firecracker jatropha, and Kahahla roses. Shelley: scabiosa in periwinkle, blackberry magenta, and dusty rose pink; Aussie Bells, grevillea foliage, white mink protea, sugarbush, Italian poppies. Something Blue Florals: how the heck do you get rid of baby's breath horrible smell?? And caspia too, while we're at it. Thank you for whatever magical trick you have up your sleeve!! A common myth is using a few drops of bleach in the water but in my experience, It really doesn't work that well. You could try a surface sealer to lock in the odor or another fabulous trick is to hit it with your favorite Febreze fragrance. The fact is every flower produces the fragrance it needs to attract the type of insect that pollinates it; in some cases flies and beetles. Sometimes you just have to embrace the good with the bad to truly appreciate the beauty of a flower. Sharron: Will I be able to get Peonies the third week in March? What is the season for Peonies in California? I researched this & chances for peonies at the end of March is pretty darn good. They will be imported from Holland that time of year. Our domestic season in the states generally starts around the beginning of April in California & transitions into Oregon & Washington around May, ending in August with the last blooms coming out of Alaska. It is important to note that a cold snap or heat wave can alter the cut date of these crops. Always consult with a sales rep close to the date of your event for real-time updates. Jen & Jesse: Sales rep pain-points/pet peeves - how can floral designers make their lives easier? Late orders! We always strive to fill every order to completion but late orders are problematic. To be fair to all of our clients, we pull our orders on a first come first served basis. That means if an item is in short supply, the shop that ordered a month in advance is going to get its order filled first. Most flowers are purchased by your wholesaler a week & a half to 2 weeks in advance. Any orders placed later than that will have additional freight cost involved to receive which will ultimately increase the cost for those flowers. Additionally, if it is a popular flower or color pallet, it may simply be sold out. Closing the deal early with your clients will ensure you get first dibs on flowers. from Shelley: Completely agree. Also placing an order for product, then when you come in to pick it up, you want to put half of it back. Or we hold things for you all week and then on Thursday or Friday you decide you don’t want/need it. This is problematic because we need to sell the product as soon as possible (it is perishable after all). I think many of you think we are such a large company we will just sell it or send it to another branch. It doesn’t work like that. FAVORITE QUESTION!! Melissa: What is the best way to clean a frog? I’ve heard soaking in bleach works but I’m worried about them rusting eventually. And googling “how to clean a frog” wasn’t very helpful. From Shelley: Rinse under warm water and use a wire brush to remove debris. You can also clean with mild detergent. They should not rust as they are usually made of stainless steel. Use a mild bleach solution to remove bacteria-not full bleach and then wash and rinse. I collect these and never have any issues with them. Penny: I'm designing a wedding show for after Valentine's day. I've seen simple to extravagant displays. Which do you think sells brides better?? From Shelley: I think you have to figure out what your wow factor is first. You have to speak to your bride. So who is that? Are you a minimalist or a maximalist. I would make your presentation have some juice to it. Keep it too simple and you look small potatoes or that you can’t handle events of any size. Too big and extravagant may scare off the bride you are looking for and you will probably waste money that you don’t have. It’s the goldilocks approach-you want something that is jusssst right. Make sure you are choosing the right wedding show for your style as well. Are you traditional or cutting edge? Cutting edge spaces tend you be smaller, therefore, your set-up looks more substantial and you can get creative with the executive too. Expo halls tend to be vast and sterile and are harder to make a dent in. If you watched December’s show, then you know that you all had some homework … who reached out to micro-influencers? Share your stories in the comments below. I’m very excited to introduce you to my special guest, Cristina Barragan, founder of Fleursociety and Chief Creative Officer of Posh Peony. The last time that Christina joined me on video was in February of 2017 and we are so very happy to have her on the show to talk about “Capturing and Converting More Leads with Email Marketing”. Mornings with Mayesh didn’t even exist back then! So before we get into our topic, why don’t you tell me what you’ve been up to lately? Christina, what process do you recommend to capture leads? After you capture the leads, then how do you build trust? Most importantly, and the point of capturing leads, can you explain your process of converting leads into meetings or bookings?